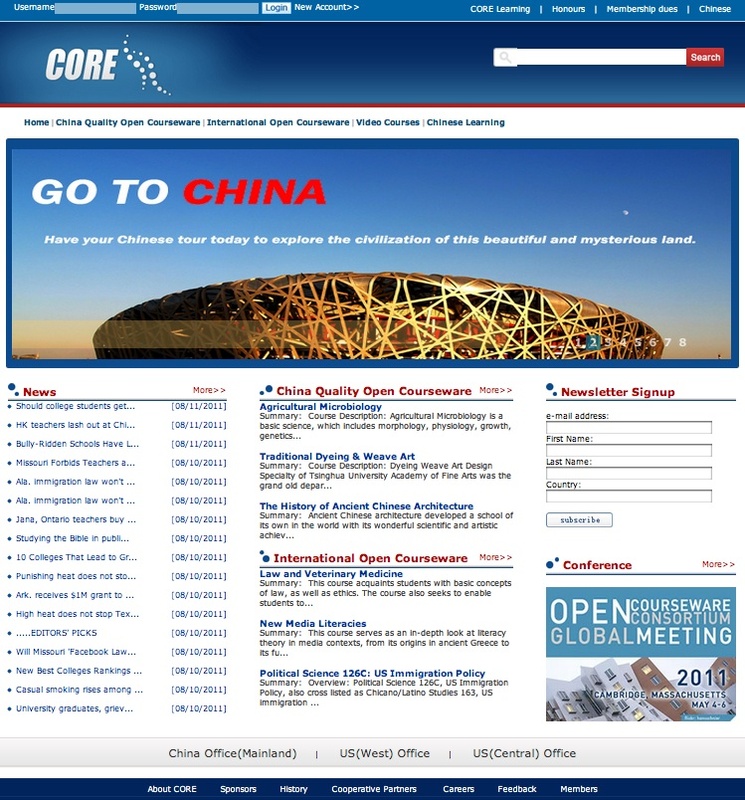 Formally a partner of MIT OpenCourseWare and a partecipating institution of the OpenCourseWare Consortium, the China Open Resource for Education (CORE) initiative has introduced a considerable amount of overseas educational resources into China. Founded jointly by the Hewlett Foundation and the International Engeering Technology Educational Foundation, CORE considers the development of China Quality OpenCourseWare as an opportunity to share Chinese educational resources with other International universities. Over 222 universities have been partecipating to the CORE project, with more than 1,100 course material translated into Chinese. The project’s main goal is to provide Chinese universities with free and easy access to global open educational resources. Currently students can access open courseware through CORE webpages and course listings, with highly accessible content formats. In the website a Video Course section – managed by a professional staff – is also available for chinese speaking users. The course listing is retrievable by clicking an icon on the left frame (CQOCW), which is quite difficult to locate, but any program material and related webpages can be easily accessed in a standard format. So far the site is lacking any search facility or navigational aid, which may improve its usability.